Take Refuge In Pleasure: The Songs of Roxy Music Revisited – Both Versions Shipping Now! The Deluxe & Delightful Edition of Take Refuge In Pleasure: The Songs of Roxy Music Revisited features 42 imaginative and diverse covers on 3 CDs. The Early Roxy Music Revisited disc contains covers of songs from the first two Roxy Music albums - Roxy Music and For Your Pleasure. The Later Roxy Music Revisited disc contains covers from the final six Roxy Music albums - Stranded, Country Life, Siren, Manifesto, Flesh and Blood, and Avalon. Finally, the Roxy Progeny Revisited disc contains covers of "Roxy Progeny" – the work of Brian Eno, Bryan Ferry, Andy Mackay, and Phil Manzanera outside of Roxy Music. 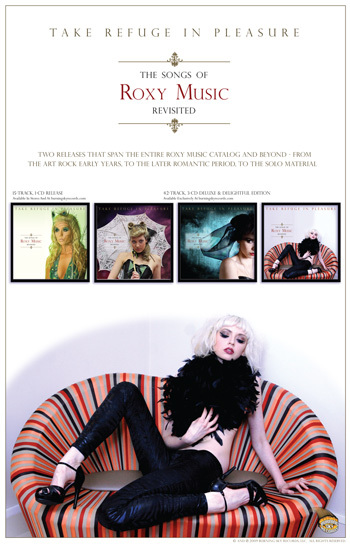 No Roxy Music tribute album provides as complete and thorough a tribute as ours! We've even tried to recreate the glamour of the old Roxy album covers. First of all, the album comes packaged in a gorgeous custom-designed, glossy 6" square "Mini LP sleeve." Each of the three discs is then packaged in a smaller glossy full-color sleeve, and each sleeve features a different (and beautiful!) Cover Model. We conducted a global Songs of Roxy Music Revisited Cover Model Search and received photo submissions from all over the world. The front Cover Model is stunning Australian swimsuit and TV spokesmodel Sheridyn Fisher in what is an undeniably Roxy pose.The other sleeves feature Australian model Sigrid Baker (Early Roxy Music Revisited), Slovakian model Sharuzen (Later Roxy Music Revisited), and Irish model Sundara O'Higgins (Roxy Progeny Revisited). Buy this record and you will get the true Roxy Music Experience! Bryan Ferry and Andy Mackay have the record in their personal collections - why shouldn't you? Also, the 3-disc, 42-track Deluxe & Delightful Edition!